Want some serious bragging rights in the tech community? Why? Inquire within yourself whether this craving for attention is healthy, and if you still want those rights, consider bidding on this one-of-a-kind iPad Pro and accessories designed by Jony Ive. It’s for a good cause, or at least you can tell yourself that. It’s all part of a fundraiser for London’s Design Museum, which is moving this year to Kensington from its historic digs on the Thames just east of the Tower Bridge. 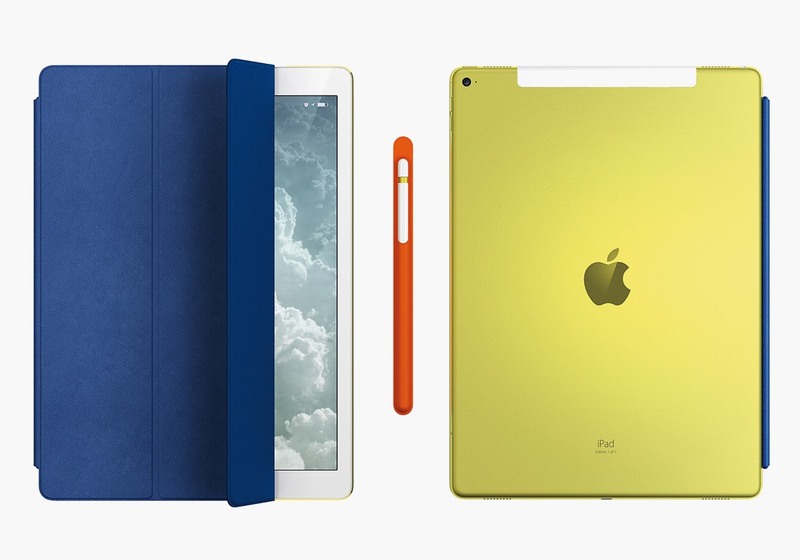 The iPad is of the Pro 12.9″ variety, and Ive has had it anodized with a special yellow dye. It comes with a cobalt blue leather smart cover, lined with the original microfiber: suede. You’ll want the Apple Pencil as well, which has a fiery orange leather case. “Edition 1 of 1” is laser etched on the back of the iPad, in case people don’t believe you. Of course, anyone can have that etched on their device, though theirs certainly won’t be as yellow as yours. The iPad will be up on the block come April 28, and the auctioneers expect bids to reach £10-15,000 (about $15-20,000). If you’d prefer a fine vintage bike or a charming mid-century daybed, check out the online auction, currently underway.